Linda Roast BA, studied Art and Design at St Martin's School of Art, London 1974 - 77. She worked successfully in design for many years whilst continuing her passion for Life Drawing. Interested in the freedom and vitality of line, her pastel Life work is completed with passion and speed. Whilst still continuing to experiment with Life Drawing marks and techniques, she now also experiments with portraiture using acrylics. 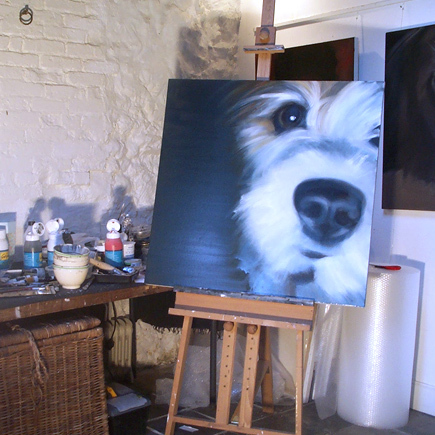 Her portraits are generally of relationships important to her life which includes her dog Edith. Her interest is still in the freedom of a mark and it's use in the illusion of the three dimensional on a two dimensional plain. Speed still plays an important role in capturing visual vitality. Art and Design at St Martin's School of Art, London 1974 - 77.